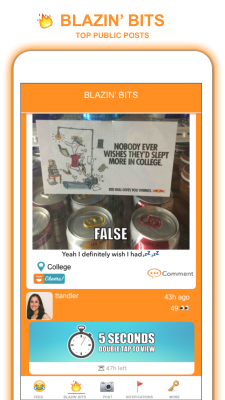 Humor is magical – it’s therapeutic, it can be persuasive or zany, it brings people together – and now you can share your amazing moments virtually with all your friends through CliqBit. 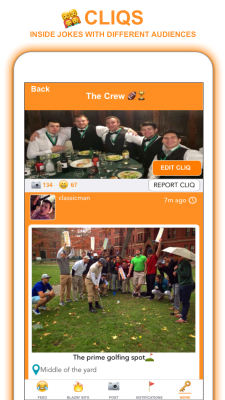 CliqBit is a new social network specifically designed for a creative and lighthearted audience. With teens leaving Facebook in droves for more niche and creative networks, CliqBit offers a unique and relevant platform for communication. And who couldn’t use more smiles in their life?! CliqBit is an app, and currently works with iOS. 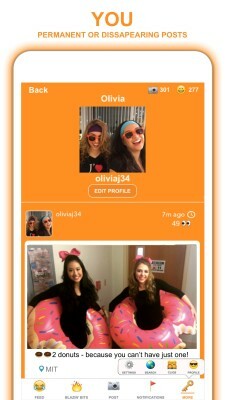 Simply download the app and begin sharing ideas, pictures, and experiences that make you laugh. 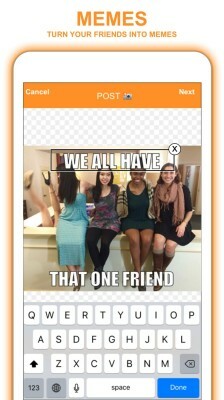 CliqBit has tools for creating memes, cropping photos, filters, etc. that add that special something that turns a chuckle into a full blown laugh attack. In addition to editing tools, the app has specific sharing and privacy settings that allow posts to be viewed for 5 seconds or 5 centuries. More permanency allows for users to cultivate a following base. In this way, the network has a good mix of spontaneous as well as deliberate content that creates a higher quality experience for everyone. I’m Hilarious, How Do I Use CliqBit? Ok Kevin Hart, download the app at the app store HERE and start wowing us! Funded: Raised $1m from family and friends. Raising Additional Money: Current fundraising will get the company through the next 18 months, but depending on the growth, CliqBit will be raising more money to accommodate their trajectory. Revenue: Cliqbit is pre revenue. For now, they are focusing more on growing their user base and less on monetization. Eventually the company will drive revenue through humorous advertisements. Right now CliqBit has 1,800 users and hopes to have exponentially more over the next 18 months by working on features to drive rapid growth. Differentiators: CliqBit is humor focused. It has advanced picture editing tools. The app can be but is not necessarily 1-on-1 messaging. Post permanency drives content. Market: Social network ad spending was $25B in 2015 and expected to be $35B in 2017, an 18% CAGR over 2 years. Market Shift: Social media is not new anymore, but it is becoming more varied. There is room in the space for specific niches geared toward different interests. Hiring: Looking to hire iOS and Android developers. Potentially also looking to hire a product manager. I sat down with Olivia Joslin, co-founder of CliqBit. Olivia and other co-founder Hannah Wei met studying at Wellesley College and after forming the initial idea for CliqBit, Olivia took a leave of absence to run the company full time with Hannah, although Hannah continues her studies at MIT in the interim. They both spend an amazing amount of time getting to know their user base through focus groups, talking to peers, friends, high schoolers and others. New ideas or features are planned and fully tested before being rolled out. Finding humor in tragedy is a particularly human motivation. Unfortunately Hannah lost sight in one of her eyes due to a degenerative disorder, and consequently lost some degree of depth perception. While walking home one day, Hannah slipped and tumbled down a snowy hill. She and Olivia had a good laugh about the incident, and a bystander was lucky enough to catch the whole thing on his phone. Out of a desire to share this funny moment came the inspiration for CliqBit. CliqBit is focusing on 2 things: 1.) creating a network people really enjoy, and 2.) growing their user base, in that order. Having a site or app go viral is not worthwhile unless users can be retained. Over the next 18 months, CliqBit will begin to bring on social influencers into their platform and grow their user base. More long term, the app will begin trial advertising to begin monetizing their user base. For more information please visit the website at www.cliqbitapp.com or download HERE at the app store!